The group of Liverpool fans that hopes to buy the club from its US owners has put together a team with business experience to aid its ambitions. 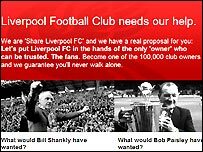 The Share Liverpool FC Group wants 100,000 fans to pledge £5,000 each to fund a £500m takeover move. So far it has received pledges of £47.5m. It has now established a steering group with finance, law and marketing skills. But there remains speculation George Gillett or Tom Hicks may sell their LFC stakes to Dubai International Capital. Those on the Share Liverpool FC legal and finance panel include Chris Talavera, a former senior partner with PricewaterhouseCoopers and chairman of Isle of Man-based Abacus Holdings, and Barrie Baxter, chief executive of business modelling software firm Brixx. Former Liverpool players Phil Thompson and John Aldridge have also come out in support of Share Liverpool, which is also being advised by Supporters Direct and law firm Cobbetts. Share Liverpool is also aware, in light of DIC's reported interest, that time could be an issue for any takeover intentions it has, and has established itself on what it calls "a proper footing". "For anybody looking to buy a football club which is valued at over £350m, and in particular one where we are asking tens of thousands of individuals to contribute several thousand pounds, we need to go through proper financial procedures," says Rogan Taylor, the founder of the initiative. "We have brought together the different skill-sets in areas such as finance, law and marketing that are needed if we are to succeed in this venture." The ownership model proposed by Share Liverpool is based on that used at Spanish giants Barcelona. However, should the £500m be raised the US duo would be under no obligation to sell. While Mr Gillett reportedly appears ready to consider the possibility of selling his stake, a spokesman for the Hicks camp has continually denied he is willing to sell. DIC appear to be unlikely to make any firm approach at present until it is clearer if Liverpool are going to qualify for next season's Champions League.